That’s exactly what [Kenneth Finnegan] figured out with his original investigation into low powered MSP430-based circuits. He was able to keep a count-up timer running off of 20F worth of capacitors for over 10 weeks. Although quite impressive by its own merit, many people left comments that questioned whether similar results would be seen in a circuit with functionality more advanced than simply incrementing a single digit on an LCD. 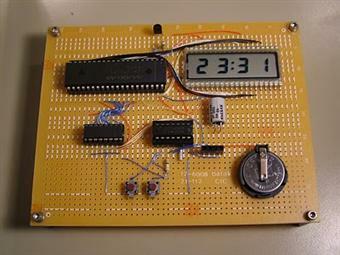 Well folks, [Kenneth] has stepped it up again with this ultra low power LCD clock. The biggest challenge in creating this clock was finding an efficient way to drive the 28 LCD segments off of the limited number of pins on his MSP430G2231 chip while still having open pins for button inputs as well. An ICM7211 LCD driver is definitely up for the task (with a few clever modifications to drive the auxiliary characters such as the center colon), but requires 8 pins to drive it. A standard 74HC595 latching shift register brings this number down to a more manageable number of 3 total pins. Once completed the total current consumption was found to be around 12μA – low enough for a claimed run-time of approximately two and a half years from the 3V 200mAh CR2032 coin cell used. If true, a set of standard AA alkaline cells in series as found in many clocks would run this little circuit for decades. Stick around for a short video after the break and make sure to check out the original blog entry for schematics and the complete source code! he built a prototype wrist watch. This is cool. I remember that brother-in law had a digital watch, I believe from Timex, that ran close to, if not over, 10 years on the same set of batteries. Absolutely incredible. This man is god. Can we get him as an author here? Certainly better than most. What is the purpose of this clock? Does he need a clock? I doubt that. Is it that hard to make some simple math calculations to get the current consumption and battery life time? No. So, apart from some of his great work, what is the purpose of this thing? Guess what?! I got a fever, and the only prescription is more clocks! how can ppl miss the point of this? function is not the goal: lowest possible power consumption is. No one asks a sprinter “whats the point of running 100m? do you need to be 100m away?” no, the point is to do something faster, better, more efficiently. geez. give the dude a break. who cares whether he made a clock or automobile engine. this one is the most efficient one he has made yet. He made the calculations that it will last 2 years, but did he take into account that the voltage of the button battery will drop below acceptable levels before that? Too bad a pair of AA batteries would be a corroded mess before the clock would stop running! Thanks SteveO! I never understand the comments bashing someone’s project. Is it jealousy? Insecurity? Immaturity? He spelled out his goals very clearly. He probably learned quite a bit and he successfully met his goals. And he shared his experience. All good things. @mjrippe do you live underwater? Can we have an MSP430 category as well? Thx for HT & link to great blog = smart stuff presented really well – spent about an hour tonight browsing some of the the enjoyables there. HT? – meant ‘heads up’..
Not to knock the creator, but isn’t this a battery life that’s basically the same as any old digital watch? I get 2-3 years per battery on mine. They got 20pin DIP, 8kb msp430g2452 now so you’re not strangled on IO and flash. Just make sure you upgrade the firmware on your launchpad cos on many boards it was unusable until you did. I think it could be better, if he used something from MSP430x4xxx series – because that series have integrated LCD driver. If a solar cell and good capacitors were employed that thing would run forever! It would never use all the power collected during a bright day, so there would be plenty extra to get through, say, a stormy week. Isn’t there any readymade LCD displays that doesn’t consume too much power like this? Mr. Finnegan did a bit more than (re)invent a digital watch. He didn’t use some minute 4-bit processor, he used a MSP430-series chip, a cpu that you can use to do serious work. What he’s demonstrating is that no matter how much crap you’re hanging off that controller, you can still whittle down the power draw when you want to. It would be interesting to see how low power he could get using a really low power mcu with built in lcd-controller, like the efm32 or stm32l. A real time clock application with lcd display on the efm32 is around 2-3uA current consumption. But then you can’t use cool and old-school parts like a shift-register. The EFM32 on the starter kit will run an LCD and RTC at 4uA. The guy did a good job with the board using those components though. The MSP430 is power hungry compared to some of the new chips. Over a decade on AAs? you would have to worry about them expiring or leaking before they die of use! Wow! While reviewing the specs on the MSP430 it is obvious ultra-low power compared to the ATMEGA in my Arduino board. But, I never did the math to figure out just how low. In addition to solar and nuclear power, I suggest kinetically powered. Give it a shake every year or so. One more way to save power would be to have the display circuit off until someone presses a “time query” button. Great little video of an ultra-low power design. c.Invent has added a new log for FunKey project - All your games on your keychain !. Larry Battraw liked Open Source Turbomolecular Pump Controller. john liked Axiom: 100+kW Motor Controller.